Initially, jQuery library file is needed and download jquery.js latest version file from www.jquery.com website, or can directly download jQuery library from http://jquery.com/download/. Two versions of jQuery exists for downloading. Development version -> This version is “uncompressed” and it is used for testing & development of applications . Production version -> This version is “compressed” and used for live website. Downloading jQuery library from jQuery API and hosting files to local server. Referencing jQuery at the Google Content Delivery Network (CDN). If chooses to download the jQuery library from jQuery API, download it and now put it on a web server somewhere, so that this jQuery library can be added into HTML page with the script tag.So one of the big benefits of using the CDN is it is possible to get caching benefits because many of the popular sites out there, instead of hosting jQuery locally, will grab it off a Microsoft or Google site. In this case, use the following HTML code. Locate the downloaded file in the same directory as the pages where it has to be used. CDNs (Content Delivery Networks) offers to include jQuery library into HTML page without downloading and hosting on self. Simply give URL of one of available jQuery library. CDN files are accessed around the world which means file accessing is possible from the external server instead of hosting files local server and it offers one advantage to eliminate the file re-downloading and improves the loading time. 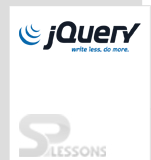 jQuery Get Started chapter draws out following main points. Instead of downloading, CDN’s can be used to improve the performance of page loading.